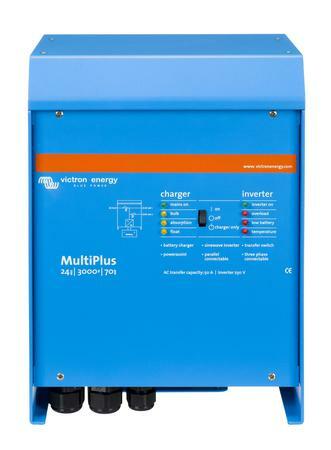 The 5000VA Victron MultiPlus inverter-charger is the largest of the MultiPlus range and is only available in 24V or 48V versions. Featuring the useful second AC output and with a high power capacity and charge current, the 3000W model is most typically used in remote power solutions and on larger / live-aboard caravans, boats and yachts. In addition, all MultiPlus inverter-charges combine a powerful true sine-wave inverter and advanced adaptive charger with a a high-speed AC transfer switch (12-millisecond changeover time).